Akio and Yoshino believed all there was left for them was to graduate, but life had different plans for them. 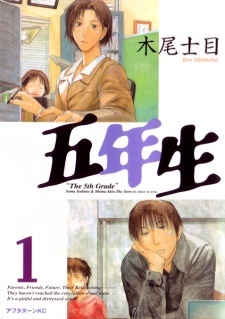 Yoshino moves on while Akio stays behind, and something between them begins to change. The story of their youth continues. TAKE NOTE TO READ YONENSEI FIRST. It seems strange that the manga artist of the more famous Genshiken series could have a work that allows itself to be such a pure dissection of human relationships, and yet be so completely under the radar. Not merely a commentary on relationships, but on the struggles of University life, the relevance of the Law, trouble with finding employment, and the nature of how we, as human beings, fool ourselves. In 31 chapters, Gonensei charts human psychology with such a startling depth of virtuosity and understanding, that it makes even the fabulously expansive Oyasumi Punpun look a tad underwhelming. One of the possible reasons for this is because Kio Shimoku, as a narrative writer and character creator, is unflinchingly out of his way to eliminate any sign of melodrama whatsoever. The characters all know the rules of the game. They talk with a slight meta-knowledge of the cliches that comes into play with regards to these matters, and yet, find themselves inevitably trapped when the worse possible things bear fruit. Inio Asano loves to punctuate his works with beautiful moments of human elevation, and empathy, but, Kio is all-human all-raw all-bleeding flaws, without any relent at all. Yet, one of the reasons this work has gone strangely under the radar, seems to be because of the strange criticism that Kio pulled things out of nowhere to make the matters even more over-dramatic, and "lacked character development". These are quite possibly the two stupidest forms of criticism that could ever come out of a person's mouth in relation to the work. The latter, especially, is based on a ridiculous notion that a work has to depict this sacred notion of Character Development. Sometimes, commentary on Stasis is just as powerful as commentary on Growth. And, anyway, people who don't see development at all must be sure as hell blind in several senses of the word. As a person who frequently goes to sites about Rationality and Meta-Cognition, I've become increasingly aware of how one of the hardest things in the world to achieve is enough prescience to escape our own horribly self-consuming mental bias. Some people, luckily, have it so that their environment from the start ferries them all the way to their grave without much of a hitch, and others struggle and die never finding out the key. Normally by telling yourself that you did something bad, you'd think you'd get out of it... but there happens to be a strange vicious cycle that may appear where by shaming yourself after doing a bad thing, you fall into a 'shame death-spiral' that leaves you even worse simply because you become too static to act, and then your fatigue takes over, and by the time you recover, you start Tabula Rasa, and the whole thing falls again. Development is achieved with viciously acquired self-knowledge, constant testing, and gradual gradual movement towards a far and possibly unreachable goal, and that's for the people who've realized this, and are actively searching knowledge bases on how to escape it. What about the rest of humanity? There's a dreadfully horrific moment in the Up Documentaries when a lower class interviewee, filmed at 21 years old, working in a meat packing plant, makes the claim that the job is "causing his mind to rot, and I don't think I'll stay here any further". By 28 years old, when they interviewed him again, not only is he still working at the same place, but he has a family and kids now, and so he's pretty much stuck in that stability to make a living for all of them. A nice metaphor for the psychologies of some people is the circle of hell in Dante's Inferno representing gluttony, where the temptation is also the punishment: you cannibalized others, and you yourself are cannibalized. Eventually these people either last their whole lives being eaten and somehow make a good show of it (and they spread themselves throughout all classes, from the rich to the poor), being able to contribute to human societal development in the meantime, or they break down, and get silently ferried out. Corruption, Political Scandal, Celebrity Scandal etc... are all expanded versions of the consequence of Infernic Logic, but these are only the most publicized ones. Many people get consumed every day by their own strangling mind-structure without the notion ever coming to light. Now to sink my teeth into our main characters, the everlasting stars of the show. Akio is what you call the archetypal slacker-type, whose most idealistic form can probably be seen in Clannad, whereas quite a number of Asano's characters can settle into the more cynical range of these types, but, in whatever of Manga and Anime I've seen, it seems that Akio is the most cynical representation that isn't a straight out 'pigsty-NEET' (e.g. Ressentiment's main character). He is, in the most honest sense of the word, meandering, and ridiculously hopeless, and yet he's also strangely very smart about it. He is the purest example of an all-talk-no-action character, that depicts the worse trappings of all of the stuff I said above about people being conscious of their own flaws, yet still finding it unbearably hard to get over them. In fact, the reasons he even bothers to move out of his empty cycles are all emotional in nature. But the greatest sleight-of-hand that Kio has played in making him, is that he has made Akio a fully empathetic character, while using that very empathy to undercut the character. When you look at Akio you immediately get attached to all the pre-conceived notions you have of the archetype, that he actually has a heart of gold, and that he actually is just an unlucky dude trying to get by, and his musings are funny and deeply relatable to anyone else who has lived through a period in their life floating around like that. Yet, it's all a magic trick, because one of the comments that another character remarks of him is that he (paraphrased) "gets involved in all the relationships, but, always manages to come out unscathed, while everyone else is licking their own wounds" and criticizes him for playing the victim card. Most of Akio's thought processes, though relatable, are deeply tilted towards himself. Part of the problem of the relationship is how he shifts the blame of his insecurities to the other party, Yoshino, and, is meanderingly quick to get back into his own 'flow'. But, Akio is outshined by Yoshino, who is another beast of a character in terms of complexity. In fact, the only reason Akio grows is that Yoshino outplays him in getting him to, as painfully as possible, realize his own flaws in a deeply fundamental way. Yoshino is a character who is, in the similar way that Alex Sheremet describes Woody Allen's character in Annie Hall, "smarter" than others, but more fundamentally flawed in her own biases, and her inability to untie these biases. All these culminates into one of the most intense scenes in the entire manga, where her whole psychology is developed. And yet, none of the psychological turns are really unprecedented. She had early signs of it, like the long string of 'idiot boyfriends' (indicating her interests only in relationships that serve to bolster her intellectual ego), or her control freak mentality in certain sections. And yet, even on a level above psychology, the Law serves as a recurring motif within the work itself. The complex depiction of a relationship is linked with the complex notion of why the Law exists. It is pointed out that crime will exist despite the Law, due to individual motivations, and yet by having it written down in full, the baseline for human interaction is provided. Yoshino dances on the thin line between her belief in the idea of the Law, her profession only taken out of pragmatic comfort, and her own failures as a moral being. Within this larger context of a societal Law, which Akio is forced to live by, and desperately tries to opt out at every turn, he also has to deal with the intricate needs and desires that have to be balanced between himself and Yoshino in their flawed relationship. This 'Necessary Evil of the Law' plays out on an individual level, between two people, underlining the small fundamentals which all Crime is based on. But, at the end of all this, one finds the ending amazingly graceful in its resolution. Neither static nor gratuitously developed. A bit of forward momentum, which is, really, the most important thing that can be gained at the end of any long and arduous struggle. Some people have the pathways lubricated entirely for them, and we must be nigh egoistic and presumptive to assume the same ways will be open to ourselves, but, with their own crosses to bear, others, slow and steadily, tread on.